In 2001, Tony Fernandes signed a deal to buy a failing commercial airline for around 25 cents . Three days later, 9/11 happened: passenger numbers around the world fell 2.7% , and did not recover for several years. But despite the inauspicious timing, AirAsia quickly became a highly successful low-cost carrier. In a Facebook Live chat at the World Economic Forum’s ASEAN meeting, the Malaysian entrepreneur spoke to the Forum’s Mike Hanley about the “incredible ride” he’s been on with AirAsia, and shares what he’s learned about being a leader in a 21st-century company. Fernandes, who came up with the tagline “Now everyone can fly”, describes how, thanks to the internet, AirAsia was able to grow at a tremendous pace, going from 200,000 passengers in the company’s first year to 55 million last year. The biggest challenge faced by the airline industry today is government protectionism, according to Fernandes. Airlines are unable to operate like any other global business because of a rule that caps foreign investment . “Malaysia Airports owns an airport in Turkey; Heathrow is owned by the Spanish. Yet we’re not allowed to own 100% of airlines,” he says, referring to a new World Economic Forum report that urges governments to rethink airline ownership. Fernandes describes his leadership style as “informal”. Anyone who follows the AirAsia boss on social media might have come across videos of him walking around his offices chatting to staff, and he says that he spends half his time talking to managers about the running of the business. Asked how he motivates employees, Fernandes says being transparent is crucial – it helps to be able to see the boss and know what he or she is doing. Also, helping people to advance their careers, or “live their dreams” is key to boosting morale within companies. “We reward people – not just monetarily, because anyone can do that – but by helping them advance their careers and allowing them to live their dreams. 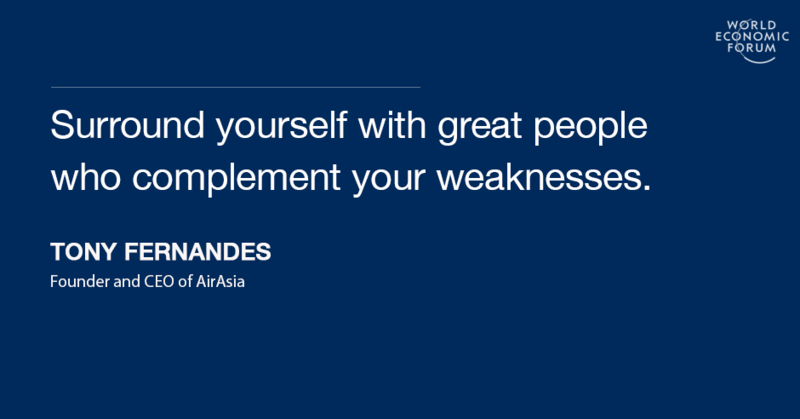 As one of ASEAN’s biggest business success stories, Fernandes was asked to share his advice for young people wanting to start a company. 1. Get a product that people want.